Autumn is a wonderful time to enjoy the Italian regions of Tuscany and Umbria, particularly for outdoorsy types. There are truffles and olives to be harvested, it’s cool enough for good fishing, and the shooting season begins-wild boar roam among the woodland, as do fallow deer, in such prodigious numbers that they have to be actively managed on many estates. But one of the big problems for field-sports fans buying property abroad is that poaching laws are different. In Italy, unless you have the correct licence for your land, all game is fair game for anyone who wants to take a shot, and only 10% of hunting land is licensed as private. 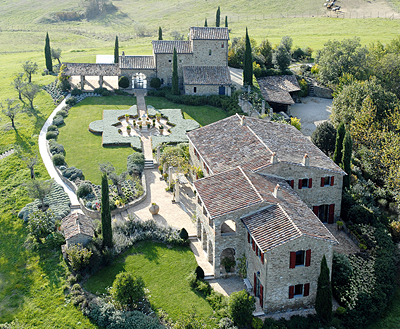 One such estate, offering extremely high-end properties for sale, and which includes 2,000 acres of private hunting land, is Castello di Reschio. A classically picturesque estate on the Tuscan/Umbrian border, Reschio is located halfway between Perugia and Cortona in the Niccone Valley. The estate was bought in 1994 by Count Antonio Bolza, the head of an Italian aristocratic family, who had the dream of bringing Reschio back to life through renovating the charming tumbledown farm houses. For the past 15 years, the family has used their own skills in architecture, fine art and design to create what have to be some of the most gloriously positioned, secluded and beautifully executed renovations in Italy. Of the 50 farmhouses on the estate, almost half have already been converted, and 10 remain for sale. Those who own here tend to be discerning buyers madly in love with Italy, and who have often already owned property there. ‘Most of them know Italy better than I do,’ quips Count Antonio’s son, Benedikt, who currently lives in the castello, but will move into his own farmhouse when it’s completed. Benedikt is a London-trained architect and relishes heading up each restoration, starting with matching farmhouse to owner. ‘Some families have numbers of large children and grandchildren and require lots of bedrooms, whereas other owners are keener on entertaining and want good reception rooms for dinners and parties, so each buyer suits a different house,’ he explains. Properties, sold freehold, have an average cost of £6 million; smaller farmhouses are less and the more prestigious projects cost double. They come with a full management and maintenance service, and all taxes and bills are taken care of for an annual fee. Owners can choose to join the rental pool (rents range from £3,300 per week to £23,000 per week, depending on the house). Once a property is bought and fully restored (a process that takes between 18 months and two years), Benedikt’s mother, Angelika, also a trained architect, consults the owners on the interiors, which are designed to complement the limestone, oak and marble from which they are fashioned. If the correct furniture can’t be found, it’s commissioned: everything is done to an exacting standard. This vast estate is crisscrossed by tracks for riding and mountain biking and is one of the only places in the world permitted to breed Pure Bred Spanish horses for grand prix dressage, a passion of Count Antonio. Owners can fish at Reschio in the cooler autumn months, as well as shoot boar, deer and clays. The estate chef, Marco, conducts cooking lessons and also provides delicious simple Italian dishes from seasonal produce that can be eaten in the estate’s own osteria or delivered straight to your house. Unlike many projects in this area of Italy, which are fractional or part of a larger development, the Bolzas are offering fairy-tale properties, freehold. Reschio has been running successfully for 15 years with more than 20 current owners-it saw its first-ever re-sales this year, and all three properties went under offer almost immediately. The remaining properies are for sale through Knight Frank (020-7629 8171; www.reschio.com).